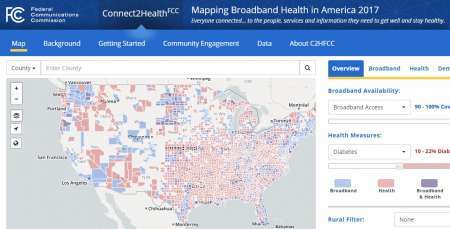 The Federal Communications Commission announced June 8 that it made updates to its Connect2Health Mapping Tool, which shows areas of the United States that lack broadband connectivity and health care resources. The changes include adding the most recent data on broadband and health care access to the map from the FCC and the Robert Wood Johnson Foundation’s County Health Rankings. Understanding the data is the first step in better leveraging broadband to help manage chronic health conditions. The mapping platform is an interactive experience, enabling detailed study of the intersection of connectivity and health for every state and county in the United States. The updated data reinforces many of last year’s key findings, including sizable and persistent rural and urban gaps. Forty-two percent of rural “critical need” counties, representing more than 2 million people, had worsening broadband and health metrics. The FCC has also released new lists of “critical need” counties that need better broadband and health care access the most. The task force also introduced the Positive Trend Counties inventory, which compares broadband and health data from each year. The new data also shows that the number of people living in “double burden” counties has increased. Almost half of U.S. counties have high instances of chronic disease along with a need for greater broadband connectivity. More than 36 million people live in counties with a “double burden” of need, which amounts to an increase of 1 million between 2014 and 2015. Preventable hospitalizations are 150 percent higher in the least connected counties compared to other counties. Despite this, some counties did experience significant positive trends in broadband access, such as Upshur County, Texas, and Monroe County, Ga., both reporting broadband access increases of 60 percent or more.